After you get a gander at this excellent project, hop on over to visit Mary at Vintage Reflections. I asked Mary if I could share her wonderful project idea with you and she said yes! Yea! I found it very inspiring and easy as well as fun for everyone. More than likely you already have everything you need at home so read on to make these wonderful clings on the cups left. For deeper detail please visit Mary's site. Find your image. How do you want to customize your item? Do you want to create seasonal or holiday decor? do you want to personalize it with someone’s name? or give it a vintage touch? Well, depending on what you want to do, you will either search for clip art on the internet or create it yourself. 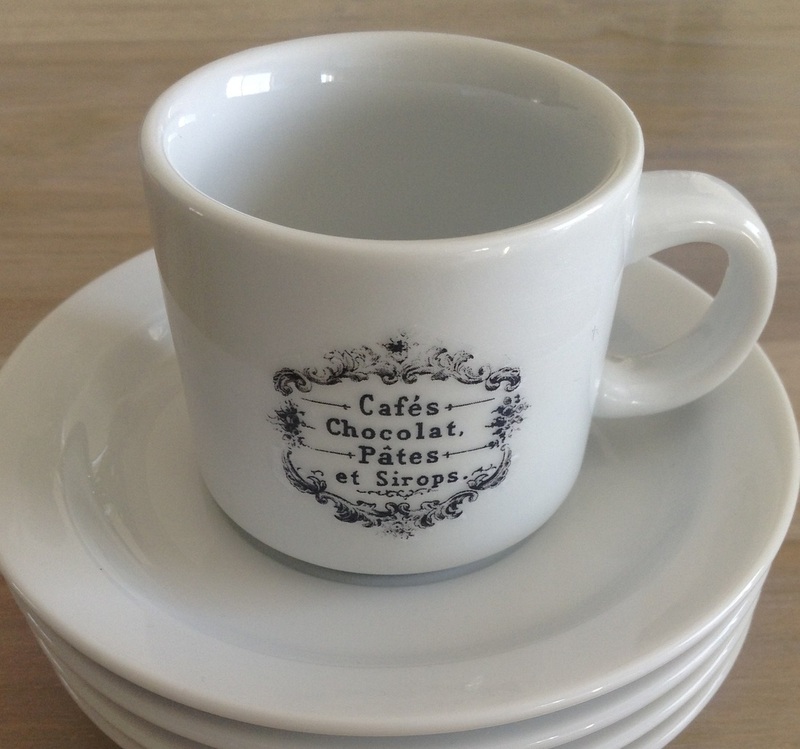 Mary wanted her espresso cups to have a vintage coffee look so she got her image from the Graphics Fairy. Or just hop on over to our freebie page On GrafXQuest to find truckloads of amazing images to use. Open up Photoshop and size it so that will fit your chosen item. You don’t have Photoshop? It’s all good. Just use any photo editing software that came with your computer. Mary copied the image and printed out 4 on one sheet of paper. No need to reverse your image. Get your packing tape and cut out a piece of tape and stick it over your image. 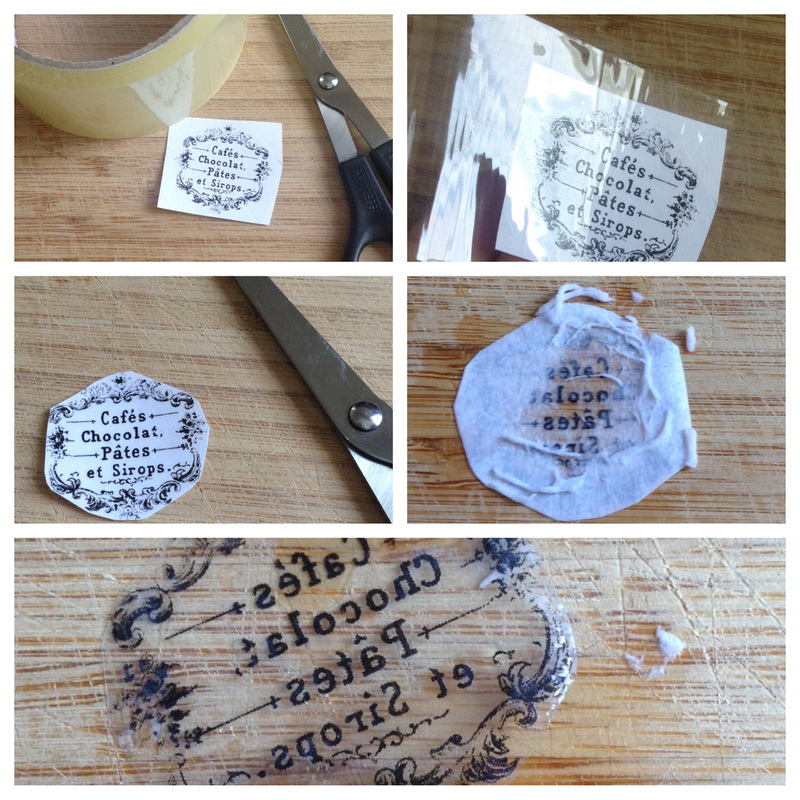 Try your best to keep it flat without wrinkling the tape. Then just rub it down with your fingernail or back of scissors to make sure it’s nice and flat. Cut your image now with the tape still stuck on it. Cut as close to your image border as you can. No waiting or drying time involved here. Get some water and wet the back of the paper. Basically you are wetting the paper side. Rub off the paper slowly and you will see the image has transferred to your tape and you now have a transparent glass cling. Wait until the back dries up a little. Mary just blew air on hers and it was dry and sticky in no time. So there’s no need to apply any adhesive. It will still be very sticky and you can now go ahead and stick it on to your glass. There you have it! Isn’t this amazing?? The beauty of this is that you can simply remove them once you get bored and start over. Just think of the possibilities. You can buy a few glass votives and customize them for each season or holiday! Imagine some cute valentines clip art for valentines, fall sayings for fall, or put someone’s name on and gift them! I hope you enjoyed this tutorial and if you create something, we’d love to see it! Thank you for stopping by! Now go and visit Vintage Reflections for some more great ideas. Mary also has a very cute Etsy shop so be sure to check that out too. Thanks Mary! Adorable Candy Wrappers. Do It Yourself Project Submitted from one of our followers Jessen. What she did. Using Photoshop she created a new file 5"X5.25" in 200 DPI.She then created what ever background she wanted using squares or dots in the colors of choice. and our bride of Frankenstein. She centered her images in the middle of the square and threw on some text. When she was happy with her creation she printed them out on photo paper, cut and wrapped her chocolate bars securing with double sided tape. Jessen said if you are not handy with Photoshop you can just print your images directly from GrafXQuest on brown paper bag or colored paper and wrap your bars. Either way don't they look yummy? Super fun to give to your trick-or-treasurers! Jessen's Candy Bars using our Halloween Images on the Freebie Page. Want to do other Candy Bar wrappers? I hunted down the sizes for you plus a few more fun oddities for your Halloween projects, Enjoy! Things you should know first. 1. This video is for a wall but you would use the same concept for the furniture piece. 2. You will need to blow up your image to a larger size. if you have a projector you can trace it onto clear plastic and put the image up on your furniture piece or if you have photo shop you can piece it out on to several pieces of letter sized paper. First open another tab so you can walk through with me...I will wait...ok are you back? Great! Ok moving on. Step 1 Click on the “Browse” button and select your file and then click “Continue”. Step 2 You will need to decide on how many sheets of paper you would like the image to be spread across on. (You can lay blank pages out on your project to see how many it will use.) Then just use the arrow keys on Blockposters.com to change the number of pages. Next select Portrait or Landscape then you will see the measurements on screen. When you have the size you want click continue. Step 4 Print out your pages and now you are ready to pick up where the video above starts! When completed, you may want to seal your piece with your favorite clear sealer to protect it. Walla Fini! Happy re-purposing! Be sure to share your DIY projects using our images. We would love to share them and also give your blog some exposure. Re-purpose a vintage basket into a towel holder. Using ribbon by threading through one end of a basket you can create a tie ribbon hanger. Mount a vintage picture frame with one of our Free images inside for decoration. Hang from a plant hanger. Fill with Towels. Simple and takes less then an hour to make! Upload your DIY projects using our free images. We would love to see your projects! Project ideas for using the free downloadable images on the Freebie page. Try turning an old baby crib into a settee. Create your own pillows by making a transfer from any of the images. Transfer to material or simply on a pillow case...stuff. Sew end closed walla! Pillows LOL. Yes it really can be that simple. How cute is this too! Upload your DIY projects featuring the free images you download and share with others. We have over 200+ followers daily. This area features YOU. Submit projects to us using Downloads from GrafXQuest as part of your project. Though we can't feature every project we will make every attempt to feature your fantastic work! Submit your Projects through contact page. Click!